Endress + Hauser has announced the launch of E-direct, a hardcopy and online catalogue offering a selection of high-quality instrumentation for several process industries. This new sales channel will offer a range of high-quality level and pressure sensors, paperless recorders, power supplies and over-voltage protectors. These carefully selected off-the-shelf products require minimal assistance to select, install and operate. Although the E-direct philosophy is Quick, Simple, Cheap, every item in the range is built to Endress + Hauser’s exacting design and manufacturing standards. Prospective purchasers will be able to look through the online or print catalogues to view the range of Endress + Hauser E-direct products. The catalogues will include product descriptions, technical specifications, wiring diagrams, dimensional drawings, application notes and installation advice. With the setting up of this simpler, direct online ordering process, Endress + Hauser will be able to offer customers quality measuring devices and components at lower prices and fast delivery. For purchases of 1 to 3 products, E-direct guarantees a 48 hour despatch, from the Sydney warehouse, with quantity discounts applicable in the quantities of 4 to 10 and 11 to 35. 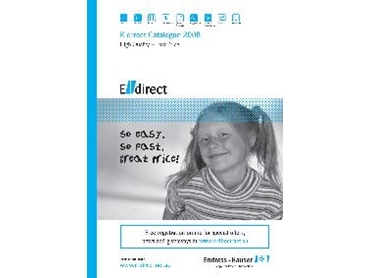 Endress + Hauser’s E-direct website will be officially launched on 16 April 2008.